Marvel vs. Capcom 2 (subtitled "New Age of Heroes") is an arcade game developed by Capcom in 2000. The game features 3 on 3 tag, compared to the 2 on 2 tag from previous games in the series. It is the only game in the series to use the NAOMI system, an arcade version of the Sega Dreamcast hardware. 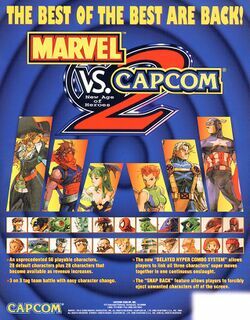 Marvel vs. Capcom 2 was later ported to the Sega Dreamcast, Xbox, and PlayStation 2. It is also slated to be released as a downloadable title on Xbox 360 and PlayStation 3 this summer. A demo was released exclusively on PlayStation Network on April 30, 2009. With the final installment of the series, Capcom simplified the engine so that it would be more accessible to casual players, in order to bring in new players, as interest in arcade fighting games had declined. Changes were made to the air combo system and the button configuration was trimmed down to 4 main buttons and 2 assist buttons. This is the first and only Marvel vs. Capcom game without character-specific endings, as one will get the same end regardless of the characters one uses or how quickly one defeats the final opponent. The PlayStation 2 and Xbox ports of this game saw a limited print run due to Capcom losing the Marvel license. While these versions are merely uncommon, high demand has caused their prices to skyrocket both in stores and online. Ironically, the Dreamcast version is the closest of the three home console ports to the arcade version, and at the same time it is the cheapest due to a higher number of copies produced. When the earth and everything on it begins to die, Ruby Heart traces the source to an evil being known as Abyss, the Armor of Erosion. She summons the greatest heroes to her airship to find the being. Ultimately, its source of power is revealed to be a mysterious black metal ball within its center. The ending suggests that the sphere may be worthless now given the massive crack in it; Ruby holds it in her hand and regards it briefly before throwing it over her back into the water, letting it sink to the bottom. This page was last edited on 17 May 2016, at 18:30. This page has been accessed 148,939 times.